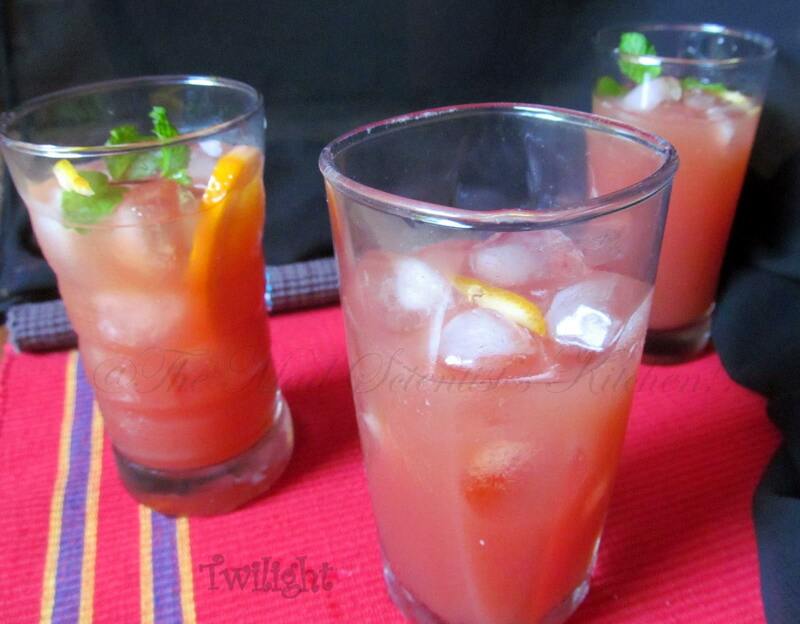 Twilight a delicious mocktail is a must have not just for a party but also as a drink for Summer. I am sure you know but for the sake of repetition let’s see what a cocktail is. containing alcohol. Modern cocktails have a mixture of one or more types of liquor and flavourings and one or more liqueurs, fruit juices, sugar, honey, water, ice, soda, milk, cream, herbs, bitters, etc. Cocktails are made with gin, whiskey, rum, tequila, brandy, wine, beer, vodka, etc. In short, a mocktail is a non-alcoholic cocktail. Again like a cocktail, you mix 2 or more non-alcoholic ingredients to get a mocktail. So let’s have mocktails I have chosen for today a simple drink so delicious that you will want more of it. This is built it in the glass itself. Lovely no tail…must be tasty as well! Sorry typo …I said mock tail !